An odd thing on a Saturday evening to discover on Twitter that the most interesting man in the world has died. And to recall that he had shared my birthday, August 5. There’s a curious boding in birthdays. I had met him. Met him at an embassy in Washington, DC, where despite the fact he was guest of honor there seemed much more interest in the cocktails than in shaking his hand. So I shook it. And we talked. About the moon, about the occasion, and about C-PET. And our shared birthday. The comparison with Steve Jobs is illuminating in so many ways. I don’t know whether they ever met. It would have been a fascinating encounter. The visionary of the miniature in conversation with the epitome of the astronomic. Together, these two dead engineers define an era, itself the platform that lays claim to the future, a future in which the exponential explosion of digital technology has enabled us to leverage our human engineering capacities beyond all prediction – and which has engaged them to serve ends that history will surely see as equally cool and equally trivial. It’s Peter Thiel, whom I greatly admire even though I don’t share all of his analysis, who quips that we wanted flying cars and got 140 characters. Had his target been Facebook, on whose board he sits, rather than Twitter, it would have been easier to cry Huzzah! But his point is fundamentally sound. When I was a kid (and, by the way, ran the astronomy club at my English boys’ school), the coolest of all kids wanted to be astronauts. Raise the question now and you are likely to get a yawn, or worse. Anyone who’s into engineering wants to work in the Solar System that for so long circled around Steve Jobs. Micro has displaced macro; the human imagination has become absorbed with digitally-enabled human interaction, so “the social network” seeks, allegedly altruistically though undeniably IPO-ly, to connect all 7 billion of us so we can share our kids’ (and kittens’) pics. This cosmic narcissism stands in so great contrast to the vision of cosmic Columbuses and Vasco de Gamas as to be hard to grasp by those who love children (and kittens) and yet stare at the night sky and lust after both knowledge and presence. Andrew Keen’s brilliant and non-naive critique of naive digital culture, Digital Vertigo, has forcibly reminded us of the flawed genius of utilitarianism. If what truly matters is for us to be happy, if the summum bonum of Homo sapiens lies not in the beatific vision and the cultural mandate (and if, dear secular thinker, you don’t know what they mean, o boy, you should), or even a post-theistic re-statement of them both, but in a mirror and a merely social network, then who can challenge the Lotos-eaters or their chip-popping couch potato cognates, for whom the good life is merely the life at ease? This same week, Elisabeth Murdoch, daughter of The Murdoch, turned her family’s business debacle into an exercise in education – in her Edinburgh lecture which the establishment of my former nation regards as the year’s top occasion for media discourse. What is the point of profit, she asked? It needs to have a point. The transcendence milled into human nature, whether or not understood within the Judeo-Christian frame – which set the stage for science as well as democracy (yes, through the proud Enlightenment) – demands always something beyond itself. Else why for modest rewards and ambiguous esteem have so many of our countrymen and women lost limbs and lives in jungles and deserts and mountains far from our alabaster cities? Humans constantly grasp after reductionism, with happiness as its goal and no judgment as to means; at the same time as their striving for what lies beyond becomes frenetic. And yet, three short years after Armstrong set his feet upon that other cosmic body, we lost interest. Budgets, priorities. And we had knocked the Soviets into a cocked hat. And space costs moolah and does not win elections. This modest engineer became a Right Stuff pilot and the first walker on another world. 43 long years later we are ambling back into the game. There’s time to make up. Perhaps, with SpaceX and others, we can. It’s hard to see what sense America makes without a sustained engagement in the future. JFK’s moon commitment and its follow-through across a decade of leaders offer a benchmark of national capability and trans-party vision. To strive, to seek, to find, and not to yield. Ulysses, aged now, sets out on another voyage. It was of course Tennyson who had written 10 years before of the Lotos-Eaters. There really are only two courses. In 1832, and 1842, he laid them bare. Oh yes, and Tennyson was born on August 6. Close. Farewell, man on the moon. 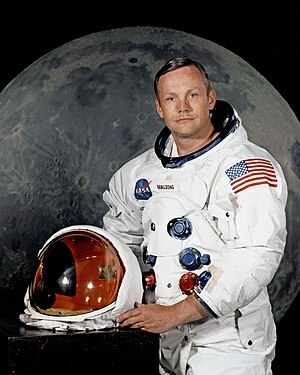 Neil Armstrong, First Man on Moon, Dies at 82 – NYTimes.com. This entry was posted in business, future, leadership, policy and tagged Fermi Paradox, Lotos-Eaters, Neil Armstrong, Steve Jobs, United States by Nigel Cameron. Bookmark the permalink.